Coronal section of a human brain. BA41(red) and BA42(green) are auditory cortex. 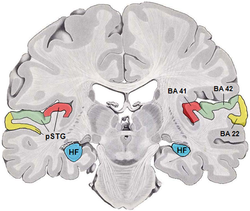 BA22(yellow) is Brodmann area 22, HF(blue) is hippocampal formation and pSTG is posterior part of superior temporal gyrus. The auditory cortex is the part of the temporal lobe that processes auditory information in humans and other vertebrates. It is a part of the auditory system, performing basic and higher functions in hearing, such as possible relations to language switching. 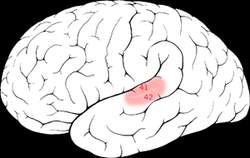 It is located bilaterally, roughly at the upper sides of the temporal lobes – in humans on the superior temporal plane, within the lateral fissure and comprising parts of Heschl's gyrus and the superior temporal gyrus, including planum polare and planum temporale (roughly Brodmann areas 41, 42, and partially 22). Unilateral destruction, in a region of the auditory pathway above the cochlear nucleus, results in slight hearing loss, whereas bilateral destruction results in cortical deafness. The auditory cortex was previously subdivided into primary (A1) and secondary (A2) projection areas and further association areas. The modern divisions of the auditory cortex are the core (which includes A1), the belt, and the parabelt. The belt is the area immediately surrounding the core; the parabelt is adjacent to the lateral side of the belt. Besides receiving input from the ears via lower parts of the auditory system, it also transmits signals back to these areas and is interconnected with other parts of the cerebral cortex. Data about the auditory cortex has been obtained through studies in rodents, cats, macaques, and other animals. In humans, the structure and function of the auditory cortex has been studied using functional magnetic resonance imaging (fMRI), electroencephalography (EEG), and electrocorticography. Like many areas in the neocortex, the functional properties of the adult primary auditory cortex (A1) are highly dependent on the sounds encountered early in life. This has been best studied using animal models, especially cats and rats. In the rat, exposure to a single frequency during postnatal day (P) 11 to 13 can cause a 2-fold expansion in the representation of that frequency in A1. Importantly, the change is persistent, in that it lasts throughout the animal's life, and specific, in that the same exposure outside of that period causes no lasting change in the tonotopy of A1. As with other primary sensory cortical areas, auditory sensations reach perception only if received and processed by a cortical area. Evidence for this comes from lesion studies in human patients who have sustained damage to cortical areas through tumors or strokes, or from animal experiments in which cortical areas were deactivated by surgical lesions or other methods. Damage to the auditory cortex in humans leads to a loss of any awareness of sound, but an ability to react reflexively to sounds remains as there is a great deal of subcortical processing in the auditory brainstem and midbrain. Human brain scans indicated that a peripheral bit of this brain region is active when trying to identify musical pitch. Individual cells consistently get excited by sounds at specific frequencies, or multiples of that frequency. The auditory cortex plays an important yet ambiguous role in hearing. When the auditory information passes into the cortex, the specifics of what exactly takes place are unclear. There is a large degree of individual variation in the auditory cortex, as noted by biologist James Beament, who wrote, “The cortex is so complex that the most we may ever hope for is to understand it in principle, since the evidence we already have suggests that no two cortices work in precisely the same way." In the hearing process, multiple sounds are transduced simultaneously. The role of the auditory system is to decide which components form the sound link. Many have surmised that this linkage is based on the location of sounds. However, there are numerous distortions of sound when reflected off different media, which makes this thinking unlikely. The auditory cortex forms groupings based on fundamentals; in music, for example, this would include harmony, timing, and pitch. The primary auditory cortex lies in the superior temporal gyrus of the temporal lobe and extends into the lateral sulcus and the transverse temporal gyri (also called Heschl's gyri). Final sound processing is then performed by the parietal and frontal lobes of the human cerebral cortex. Animal studies indicate that auditory fields of the cerebral cortex receive ascending input from the auditory thalamus, and that they are interconnected on the same and on the opposite cerebral hemispheres. The auditory cortex is composed of fields which differ from each other in both structure and function. The number of fields varies in different species, from as few as 2 in rodents to as many as 15 in the rhesus monkey. The number, location, and organization of fields in the human auditory cortex are not known at this time. What is known about the human auditory cortex comes from a base of knowledge gained from studies in mammals, including primates, used to interpret electrophysiological tests and functional imaging studies of the brain in humans. When each instrument of a symphony orchestra or the jazz band plays the same note, the quality of each sound is different — but the musician perceives each note as having the same pitch. The neurons of the auditory cortex of the brain are able to respond to pitch. Studies in the marmoset monkey have shown that pitch-selective neurons are located in a cortical region near the anterolateral border of the primary auditory cortex. This location of a pitch-selective area has also been identified in recent functional imaging studies in humans. The primary auditory cortex is subject to modulation by numerous neurotransmitters, including norepinephrine, which has been shown to decrease cellular excitability in all layers of the temporal cortex. alpha-1 adrenergic receptor activation, by norepinephrine, decreases glutamatergic excitatory postsynaptic potentials at AMPA receptors. Areas of localization on lateral surface of hemisphere. Motor area in red. Area of general sensations in blue. Auditory area in green. Visual area in yellow. The auditory cortex is the most highly organized processing unit of sound in the brain. This cortex area is the neural crux of hearing, and—in humans—language and music. The auditory cortex is divided into three separate parts: the primary, secondary, and tertiary auditory cortex. These structures are formed concentrically around one another, with the primary cortex in the middle and the tertiary cortex on the outside. The primary auditory cortex is tonotopically organized, which means that neighboring cells in the cortex respond to neighboring frequencies. Tonotopic mapping is preserved throughout most of the audition circuit. The primary auditory cortex receives direct input from the medial geniculate nucleus of the thalamus and thus is thought to identify the fundamental elements of music, such as pitch and loudness. An evoked response study of congenitally deaf kittens by Klinke et al. utilized local field potentials to measure cortical plasticity in the auditory cortex. These kittens were stimulated and measured against a control (an un-stimulated congenitally deaf cat (CDC)) and normal hearing cats. The field potentials measured for artificially stimulated CDC were eventually much stronger than that of a normal hearing cat. This finding accords with a study by Eckart Altenmuller’s, in which it was observed that students who received musical instruction had greater cortical activation than those who did not. The auditory cortex has distinct responses to sounds in the gamma band. When subjects are exposed to three or four cycles of a 40 hertz click, an abnormal spike appears in the EEG data, which is not present for other stimuli. The spike in neuronal activity correlating to this frequency is not restrained to the tonotopic organization of the auditory cortex. It has been theorized that gamma frequencies are resonant frequencies of certain areas of the brain, and appear to affect the visual cortex as well. Gamma band activation (25 to 100 Hz) has been shown to be present during the perception of sensory events and the process of recognition. In a 2000 study by Kneif and colleagues, subjects were presented with eight musical notes to well-known tunes, such as Yankee Doodle and Frère Jacques. Randomly, the sixth and seventh notes were omitted and an electroencephalogram, as well as a magnetoencephalogram were each employed to measure the neural results. Specifically, the presence of gamma waves, induced by the auditory task at hand, were measured from the temples of the subjects. The OSP response, or omitted stimulus response, was located in a slightly different position; 7 mm more anterior, 13 mm more medial and 13 mm more superior in respect to the complete sets. The OSP recordings were also characteristically lower in gamma waves, as compared to the complete musical set. The evoked responses during the sixth and seventh omitted notes are assumed to be imagined, and were characteristically different, especially in the right hemisphere. The right auditory cortex has long been shown to be more sensitive to tonality, while the left auditory cortex has been shown to be more sensitive to minute sequential differences in sound, such as in speech. Tonality is represented in more places than just the auditory cortex; one other specific area is the rostromedial prefrontal cortex (RMPFC). Janata et al., in their 2002 study, explored the areas of the brain which were active during tonality processing, by means of the fMRI technique. The results of this experiment showed preferential blood-oxygen-level dependent activation of specific voxels in RMPFC for specific tonal arrangements. Though these collections of voxels do not represent the same tonal arrangements between subjects or within subjects over multiple trials, it is interesting and informative that RMPFC, an area not usually associated with audition, seems to code for immediate tonal arrangements in this respect. RMPFC is a subsection of the medial prefrontal cortex, which projects to many diverse areas including the amygdala, and is thought to aid in the inhibition of negative emotion. ^ Cf. Pickles, James O. (2012). An Introduction to the Physiology of Hearing (4th ed.). Bingley, UK: Emerald Group Publishing Limited, p. 238. ^ Blanco-Elorrieta, Esti; Liina, Pylkkanen (2017-08-16). "Bilingual language switching in the lab vs. in the wild: The Spatio-temporal dynamics of adaptive language control". Journal of Neuroscience. 37 (37). ^ Cf. Pickles, James O. (2012). An Introduction to the Physiology of Hearing (4th ed.). Bingley, UK: Emerald Group Publishing Limited, p. 211 f.
^ Moerel, Michelle; De Martino, Federico; Formisano, Elia (29 July 2014). "An anatomical and functional topography of human auditory cortical areas". Frontiers in Neuroscience. 8: 225. doi:10.3389/fnins.2014.00225. PMC 4114190. PMID 25120426. ^ Rauschecker, Josef P; Scott, Sophie K (26 May 2009). "Maps and streams in the auditory cortex: nonhuman primates illuminate human speech processing". Nature Neuroscience. 12 (6): 718–724. doi:10.1038/nn.2331. PMC 2846110. PMID 19471271. ^ de Villers-Sidani, Etienne; EF Chang; S Bao; MM Merzenich (2007). "Critical period window for spectral tuning defined in the primary auditory cortex (A1) in the rat". J Neurosci. 27 (1): 180–9. doi:10.1523/JNEUROSCI.3227-06.2007. PMID 17202485. ^ Cavinato, M.; Rigon, J.; Volpato, C.; Semenza, C.; Piccione, F. (January 2012). "Preservation of Auditory P300-Like Potentials in Cortical Deafness". PLoS ONE. 7 (1): e29909. doi:10.1371/journal.pone.0029909. PMC 3260175. PMID 22272260. ^ Heffner, H.E. ; Heffner, R.S. (February 1986). "Hearing loss in Japanese macaques following bilateral auditory cortex lesions" (PDF). Journal of Neurophysiology. 55 (2): 256–271. doi:10.1152/jn.1986.55.2.256. PMID 3950690. Archived from the original (PDF) on 2 August 2010. Retrieved 11 September 2012. ^ Rebuschat, P.; Martin Rohrmeier, M.; Hawkins, J.A. ; Cross, I. (2011). Human subcortical auditory function provides a new conceptual framework for considering modularity. Language and Music as Cognitive Systems. pp. 269–282. doi:10.1093/acprof:oso/9780199553426.003.0028. ISBN 9780199553426. Retrieved 11 September 2012. ^ Krizman, J.; Skoe, E.; Kraus, N. (March 2010). "Stimulus Rate and Subcortical Auditory Processing of Speech" (PDF). Audiology and Neurotology. 15 (5): 332–342. doi:10.1159/000289572. PMC 2919427. PMID 20215743. Retrieved 11 September 2012. ^ Strait, D.L. ; Kraus, N.; Skoe, E.; Ashley, R. (2009). "Musical Experience Promotes Subcortical Efficiency in Processing Emotional Vocal Sounds" (PDF). Annals of the New York Academy of Sciences. 1169 (1): 209–213. doi:10.1111/j.1749-6632.2009.04864.x. PMID 19673783. Archived from the original (PDF) on 15 April 2012. Retrieved 11 September 2012. ^ Chechik, Gal; Nelken, Israel (2012-11-13). "Auditory abstraction from spectro-temporal features to coding auditory entities". Proceedings of the National Academy of Sciences of the United States of America. 109 (46): 18968–18973. doi:10.1073/pnas.1111242109. ISSN 0027-8424. PMC 3503225. PMID 23112145. ^ Beament, James (2001). "How We Hear Music: the Relationship Between Music and the Hearing Mechanism". Woodbridge: Boydell Press: 93. ^ Cant, NB; Benson, CG (June 15, 2003). "Parallel auditory pathways: projection patterns of the different neuronal populations in the dorsal and ventral cochlear nuclei". Brain Res Bull. 60 (5–6): 457–74. doi:10.1016/S0361-9230(03)00050-9. PMID 12787867. Archived from the original on May 1, 2009. ^ Bendor, D; Wang, X (2005). "The neuronal representation of pitch in primate auditory cortex". Nature. 436 (7054): 1161–5. doi:10.1038/nature03867. PMC 1780171. PMID 16121182. ^ Zatorre, RJ (2005). "Neuroscience: finding the missing fundamental". Nature. 436 (7054): 1093–4. doi:10.1038/4361093a. PMID 16121160. ^ Dinh, L; Nguyen T; Salgado H; Atzori M (2009). "Norepinephrine homogeneously inhibits alpha-amino-3-hydroxyl-5-methyl-4-isoxazole-propionate- (AMPAR-) mediated currents in all layers of the temporal cortex of the rat". Neurochem Res. 34 (11): 1896–906. doi:10.1007/s11064-009-9966-z. PMID 19357950. ^ Lauter, Judith L; P Herscovitch; C Formby; ME Raichle (1985). "Tonotopic organization in human auditory cortex revealed by positron emission tomography". Hearing Research. 20 (3): 199–205. doi:10.1016/0378-5955(85)90024-3. PMID 3878839. Archived from the original on 2012-09-09. ^ Klinke, Rainer; Kral, Andrej; Heid, Silvia; Tillein, Jochen; Hartmann, Rainer (September 10, 1999). "Recruitment of the auditory cortex in congenitally deaf cats by long-term cochlear electrostimulation". Science. 285 (5434): 1729–33. doi:10.1126/science.285.5434.1729. PMID 10481008. ^ Strickland (Winter 2001). "Music and the brain in childhood development". Childhood Education. 78 (2): 100–4. doi:10.1080/00094056.2002.10522714. ^ Tallon-Baudry, C.; Bertrand, O. (April 1999). "Oscillatory gamma activity in humans and its role in object representation". Trends in Cognitive Sciences. 3 (4): 151–162. doi:10.1016/S1364-6613(99)01299-1. PMID 10322469. ^ Knief, A.; Schulte, M.; Fujiki, N.; Pantev, C. "Oscillatory Gamma band and Slow brain Activity Evoked by Real and Imaginary Musical Stimuli". ^ Janata, P.; Birk, J.L. ; Van Horn, J.D. ; Leman, M.; Tillmann, B.; Bharucha, J.J. (December 2002). "The Cortical Topography of Tonal Structures Underlying Western Music" (PDF). Science. 298 (5601): 2167–2170. doi:10.1126/science.1076262. PMID 12481131. Retrieved 11 September 2012. ^ Cassel, M. D.; Wright, D. J. (September 1986). "Topography of projections from the medial prefrontal cortex to the amygdala in the rat". Brain Research Bulletin. 17 (3): 321–333. doi:10.1016/0361-9230(86)90237-6. PMID 2429740. Wikimedia Commons has media related to Auditory cortex.